STUTTGART, GERMANY, April 13, 2016 – A United States Navy Destroyer operating in international waters in the Baltic Sea experienced several close interactions by Russian aircraft on April 11 and 12. USS Donald Cook (DDG 75) encountered multiple, aggressive flight maneuvers by Russian aircraft that were performed within close proximity of the ship. 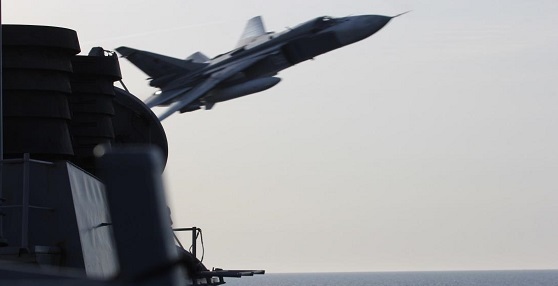 On April 11, Donald Cook was conducting deck landing drills with an Allied military helicopter when two Russian SU-24 jets made numerous, close-range and low altitude passes at approximately 3 p.m. local. One of the passes, which occurred while the Allied helicopter was refueling on the deck of Donald Cook, was deemed unsafe by the ship’s commanding officer. As a safety precaution, flight operations were suspended until the SU-24s departed the area. We have deep concerns about the unsafe and unprofessional Russian flight maneuvers. These actions have the potential to unnecessarily escalate tensions between countries, and could result in a miscalculation or accident that could cause serious injury or death. U.S. officials are using existing diplomatic channels to address the interactions, while the incidents are also being reviewed through U.S. Navy channels.